Love is in the air!!! 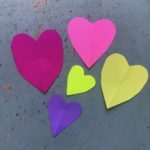 Let’s celebrate it with this fun simple project that can be created using some basic cheap materials that I am sure you will have hiding in your house somewhere! 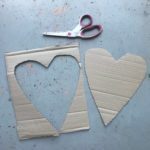 In this budget-friendly heart design we will transform a piece of cardboard box, some pieces of paper, and a few buttons into a creative ‘hanging heart’ full of love!. Suitable for kids from 4 yrs and up – a great project for little kids to practice their threading and cutting skills, and improve fine-motor skills. 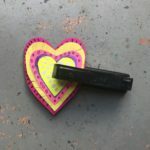 A wonderful way to explore and learn about colour, pattern and shape with your mini-maker. 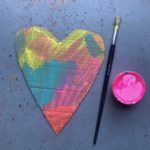 Lets get creative and make an awesome artwork for that someone special. Step 2 – paint with some bright colours and allow to dry. 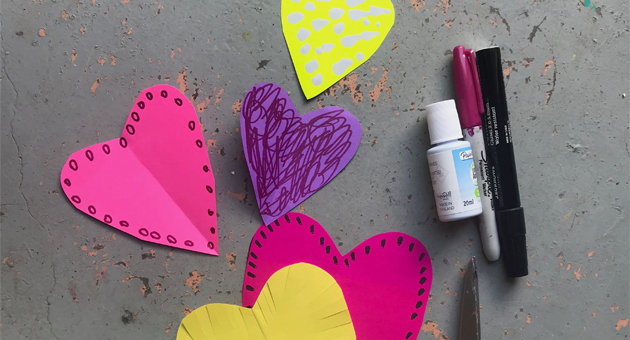 Step 3 – get 5 x different size pieces of paper – the largest piece needs to be smaller than the heart, and the other pieces need to be graduating in size from big to small. 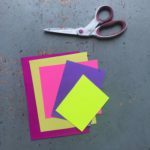 These can be different colours, and different types of paper. They need to be all rectangular. 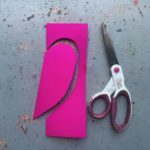 Step 4 – fold each piece long ways down centre of rectangle, and then mark in the shape of a half heart – along the folded edge. Cut these all out, to form your series of hearts. Just check that they are all fitting inside of each other size-wise. 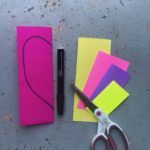 Step 5 – using pens, and scissors, ( I also used liquid paper!) 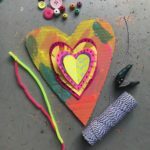 create something different on each heart – scribbles, a pattern around the edge, fringing, stripes. 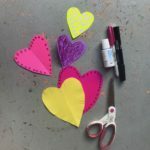 Step 6 – lay the hearts together, and staple in the middle. 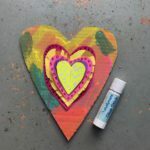 Step 7 – glue your layered hearts onto the big painted card base. Step 8 – hole punch one hole at bottom, and two holes at the top. Step 9 – thread pipe cleaner with beads/buttons – and then hook and twist through the holes at the top of the heart to create a handle. Use your string or wool to hang a decorative tail from the bottom hole. 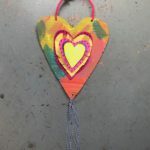 Step 10 – admire your beautiful Happy Heart – hang it on a hook for display, or give it to someone you love this Valentines Day!